It’s finally here: after 40 days and nights of Lent, Easter Sunday is this coming Sunday, April 24th. Redeemer Presbyterian Church of New Orleans invites you to come and celebrate the resurrection of the Lord Jesus Christ at its table. Worshippers of all ages, denominations, and professions are invited to join, with a service beginning at 10am at 6200 St Charles Avenue. For more information about Redeemer Presbyterian Church of New Orleans, visit RedeemerNola.com. 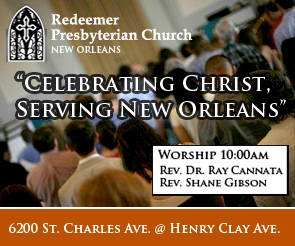 Redeemer Presbyterian Church of New Orleans: Celebrating Christ, Serving New Orleans.